Make a splash and dive into the rainbow of colors that opal has to offer! It is truly one of nature's most colorful gemstone treasures with hues in white, blue, green, yellow, orange, red, and a variety of shades in between. If you were born in the month of October, then you are one of a select few who have opal for their birthstone. While those born in other months may be limited to only one or possibly two colors for their birthstones, you are blessed with nature's entire rainbow in one magical stone. Alternative birthstones for October are pink tourmaline and pink zircon. Highly prized for its spectacular play-of-color and many varieties, makes a stunning centerpiece in any piece of jewelry. Black and crystal opals will dazzle your eyes with a kaleidoscopic array of colors and patterns, and each one is unique. Like snowflakes in winter, no two black opals are identical. If you like more subtle colors, look for a stone that exhibits pinfire. Opals that show this smaller pattern of color are amazing. As the stone moves to and fro, small points of color "blink" in and out to remind you of a starlit tropical night, but in this sky, every star is a color of the rainbow. If you prefer little or no play-of-color and warm, sunny hues, consider fire opals. Unlike the majority of opals that are opaque, fire opals can be as clear as crystal. With fire opals, you may enjoy a wide array of warm colors ranging from light yellow to cherry red. Because they are often faceted, you can marvel at the individual facets that capture the surrounding light and bring a fire opal stone to life. Do you enjoy more subdued colors? Then consider one of the blue to green Peruvian opals. Their soft, soothing colors make a great contrast to the intensely warm and vibrant colors of fire opal. If you prefer a creamy to white gemstone, then consider one of the Australian precious white opals. They are usually quite affordable and can round out your opal collection. If you prefer the eye-catching and intensely colored black or crystal opals, but price is an issue, then consider the great alternative of an opal doublets or triplets. While substantially less expensive, these gems offer the rich array of vibrant colors that are so highly desired. Doublets consist of a slice of opal backed with a matching slice of the stone's matrix or another material, which gives the opal slice strength. The opal is still real opal, just with extra enforcement to protect it. Doublets allow you to have the beautiful play-of-color that opals are known for at a fraction of the cost. Triplets are similar to doublets but with an added layer of protection on top of the stone as well. Learn more about these assembled gems. The exciting news is that all of these opals have found their way into jewelry manufacturing and are available at Jewelry Television®. Indulge yourself with opals, or find that special piece of opal jewelry for a loved one. 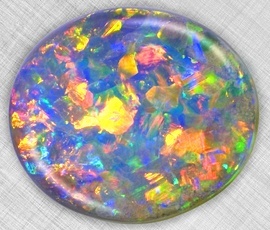 Enjoy nature's special gift to man as we celebrate the beauty and majesty of opal.